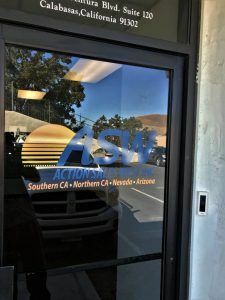 Action Sales West is a full-service candy, snacks, and grocery broker that services not only all of California but also our neighbor states, Arizona and Nevada. They have an office in Calabasas with glass doors in the front and back so they decided to get some window graphics. Most of the time, we’ll use white vinyl for window graphics because it contrasts the best against the glass. Even if the glass is clear, white vinyl can be seen the best. But if a customer wants to use a specific color, we can digitally print onto vinyl to be used for the graphic. This was the case with Action Sales West. Their logo and logo colors did a good job of representing their company, and the sunset in the logo wouldn’t have been as effective if we didn’t incorporate the gradient. In order to properly lay out a good size for window graphics, we need to know the dimensions of where the graphics are going. Action Sales West measured the doors and sent us photos along with their logo. The more information we have, the easier it is for us to understand what the customer is looking for. The graphic for the front and rear doors were made identically; even the doors were the same size. The logo was digitally printed onto vinyl, laminated, and plotted. Since these graphics were going to be applied on the outside of the window, we laminated them for additional durability. Some customers prefer to have the vinyl applied from the inside to avoid wear from the weather and potential graffiti. This is a lot easier said than done due to the fact that the other side of the vinyl is just gray. In order to apply the vinyl from the inside and have the logo visible from the outside, we reverse print the logo onto clear vinyl. By doing this, we can apply the logo from the inside. The only issue with that is that the logo is not as prominent because there is no background and from the inside, all you can see is the backward logo. Depending on what you will have on the door or window, this may work for some people. Since how the logo looked from the inside wasn’t a concern to Action Sales West, we printed the logo on solid vinyl and applied it from the outside. The graphic will definitely help people find their location and help with their branding.